The Priests and parishioners of the parish are deeply shocked and saddened at the death of our former curate Fr. John Cummins. 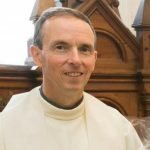 Fr John died on Wednesday at the age of 52 as a result of an accident. We extend our sympathy to all who mourn his great loss, but especially to his dear mother and his family. May John know the joy of heaven in the presence of the God he served so joyfully and faithfully.